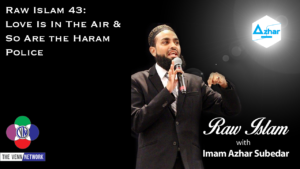 This week on the Raw Islam Podcast with Imam Azhar– a 2017 Podcast Award nominated podcast, our question of the week is recognizing halal love haram? This episode of the Raw Islam Podcast opens with B.C. Dodge complaining – that isn’t new – about how he has had no access to his TV because his daughter has been using it nonstop to watch the 2018 Winter Olympics. Imam Azhar goes on to say that beyond B.C.’s TV issues and the technology that was used to open the games, it is always a beautiful sight to see the world come together in a moment of peace. All the political differences are, kind of, set aside for a moment so that the games can take place. There was so much unity in the 2018 Winter Olympics that we even saw North Korea and South Korea come together to participate as a united Korea. But even while the world watched this amazing display of unity, the United States was still being torn apart by the never end gun debate, which is brought on by – what seems to be – the never-ending series of gun violence. But even with something like 78% of Americans not owning firearms, there seems to no end or middle ground on this conversation of gun violence. However, if North Korea and South Korea can come together as united for one week – there has to be some hope for all humanity to come together in peace. B.C. then finds an opening to make a shameless plug for the official Venn Network t-shirt, which you can get over at Amazon.com. When you buy one of these shirts you not only help support the shows like Raw Islam, but you help support all the shows on the network – like Islamic Faith in Focus – and the hosts of these show. So, help us reach a larger audience with our message and head over to Amazon.com and get yours today! Imam Azhar brings the focus back home – thank God for him – and reminds us all that, much like the snowboarders or skiers in the Winter Olympics we have to be flexible. If one of these athletes were to go down the slopes and be stiff as a board, they would fall and hurt themselves, much like these athletes we need to remember to be flexible at all times. Finally, Imam Azhar answers the big question – is Valentine’s Day halal or haram? Or does he even actually answer that question? There is only one way to find out!